The Church of England is all over the place today. Indeed, one headline seems almost purposely designed to degrade the other. In the red corner we have Archbishop Justin Welby, and in the blue corner Archbishop George Carey. 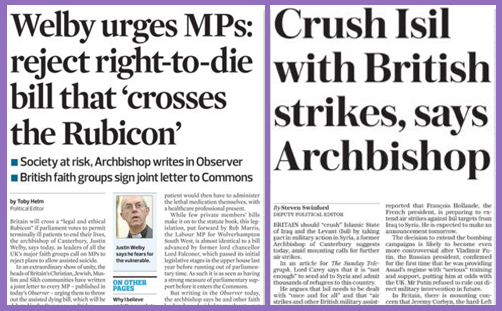 Writing in The Observer, the current Archbishop of Canterbury makes the case against assisted suicide with “a profound sense of compassion”; and in The Sunday Telegraph, the former Archbishop of Canterbury argues that we must “crush the twin menaces of Islamic State and al-Qaeda once and for all”. It’s a pity they don’t agree with each other on either of these strategies. While some individual religious voices, including that of my distinguished predecessor, Lord Carey, have called for a change in the law, the faith leaders’ letter represents the considered opinion of our communities that have analysed, discussed and debated the issue over many years. Their response springs from philosophical and theological reflections as well as from a vast range of pastoral experience and a profound sense of compassion. The inference being that Lord Carey hasn’t analysed, discussed or debated much at all, and if he has, his conclusion doesn’t spring much from that deep philosophical and theological reflection which informs Archbishop Justin on this matter: the Church of England remains officially implacably opposed to any change in the law, and (pace +Alan Wilson and his trusty chaplain Rosie Harper), there is considerable unity in the Body of Christ that “Every person’s life is of immeasurable value and ought to be affirmed, respected and cherished by society”. “Once a law permitting assisted suicide is in place there can be no effective safeguard against this worry,” insists ++Justin. “Never mind the much more insidious pressure that could come from a very small minority of unsupportive relatives who wish not to be burdened.” You simply cannot protect vulnerable adults by parliamentary well-meaning or judicial safeguards: they haven’t worked in protecting the unborn child, and that genie isn’t only out of the bottle; he has put an inflexible girdle round about the earth in 40 years and leviathan has swum a thousand leagues. But Lord Carey is absolutely right about the crisis caused by ISIS/ISIL/Islamic State. ..it would be a mistake to give way to bullying calls to immediately open our doors to tens of thousands of refugees. We are a small island and recent immigration figures are highly disturbing. Last year, a net figure of 330,000 people settled among us – more than the population of Sunderland. Imagine this continuing, year after year. ..this influx will make Europe into an even more attractive magnet for those who are genuine refugees – but also to floods of economic migrants, most of whom are young men travelling alone. We don’t even know how many of these have been combatants in the civil war. According to the Barnabas Fund, a charity which recently resettled some 50 Syrian Christian families in Poland, Mr Cameron’s policy inadvertently discriminates against the very Christian communities most victimised by the inhuman butchers of the so-called Islamic State. Christians are not to be found in the UN camps, because they have been attacked and targeted by Islamists and driven from them. They are seeking refuge in private homes, church buildings and with neighbours and family. They are the most vulnerable and repeatedly targeted victims of this conflict. Indeed, a hundred years after the Armenian and Assyrian genocide, in which over a million Christians are estimated to have been killed by Ottoman Muslims, the same is happening today in the form of an ethnic cleansing of Christians in the region. Christians have been crucified, beheaded, raped, and subjected to forced conversion. The so-called Islamic State and other radical groups are openly glorifying the slaughter of Christians. Some will not like me saying this, but in recent years, there has been too much Muslim mass immigration to Europe. This has resulted in ghettos of Muslim communities living parallel lives to mainstream society, following their own customs and even their own laws. Isn’t it high-time instead for the oil-rich Gulf States to open their doors to the many Muslims who are fleeing conflict? Surely if they are concerned for fellow Muslims who prefer to live in Muslim-majority countries, then they have a moral responsibility to intervene. Certainly, the Rev’d Giles Fraser won’t much like it: ‘Christian politicians won’t say it, but the Bible is clear: let the refugees in, every last one’, he pleads in the Guardian. But Archbishop Justin won’t be much enamoured, either. While Lord Carey insists that the European Union “should be prepared to close the doors to large numbers of economic migrants and return them to their countries”, Archbishop Justin exhorts that “Europe as a whole must rise up and seek to do what is right”, and that ‘right’ isn’t closing the doors. Migrants, refugees, dead babies and 'virtue signalling': WWJD?